handspun mitered crosses, originally uploaded by earthchick. I know I’m bombarding y’all with these, but it’s what I’ve got today. This is how many crosses I got done this summer before I put the project on hold. I am super happy with how it’s turning out. 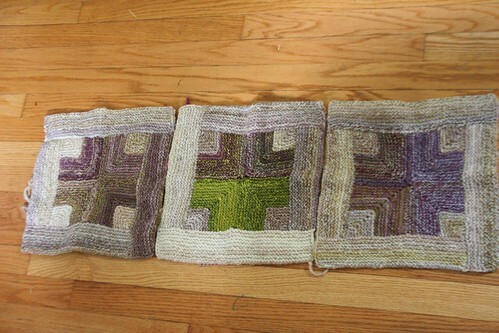 I hope to pick it back up sometime this winter and get some more squares knit. Eventually I’ll need to spin up some more of the background color. It’s so cool to be able to just whip up some more yarn when I need it! That fiber is gorgeous! 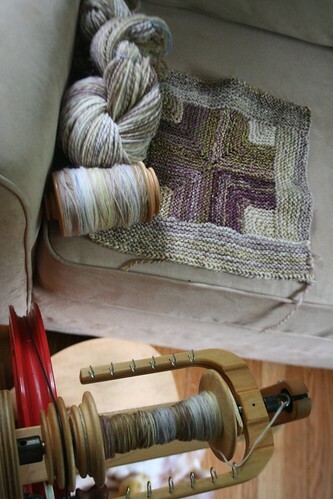 I am searching on spinning blogs and ravelry lately seeing what can be done on the LB. i like to know what to expect lol! Your blog came up in the search. So glad it did. 🙂 Love that pattern you have there too!